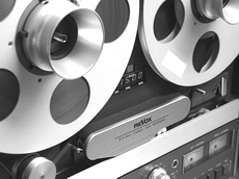 The Reel to Reel 2006 © database is a great tool if you are fond of audio tape recordings. Reel to Reel 2006 © doesn't just structure your audio tape and record archive, it is also helpful in planning recording sessions. Since much information is pre-set in the User Settings form, filling data into forms requires very little typing effort. And most important: by its powerful search functions you will stay in control of “what’s on your tapes”. Recording and sound reproduction of the Studer A810 isn't just good, it is very, very good. It's operation is not as good as the jaw-dropping performance of the A820, but it is a pleasure to work with. 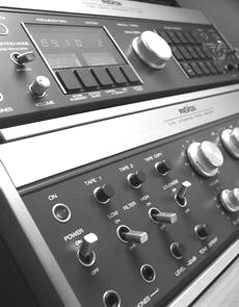 The control network of the STUDER A810 was designed as a digital system from the beginning. This means that the recorder's operation is fully programmable - not only the tape transport functions but the audio parameters as well. 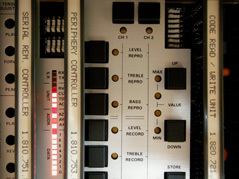 The STUDER A810 is bus-compatible through a serial remote port. Digital remote audio set-up and automatic self testing are also standard features. With the accurate SMPTE time code system of the A810, no track need be sacrificed for synchronising. The websites linked below provide information about audio tape recorders, magnetic tape storage, repair and restoration as well as general topics in audio technology. The link at the very top to Studer may be a most useful sorce to owners of Studer & Revox equipment to download dozens of operating & service manuals, brochures and diagrams for analog and digital equipment. These and many other websites in the Internet prove magnetic tape recording as a fine analog technology from the past that is kept alive by professionals and enthusiastic users alike. Some of these websites seem to be abandoned. It's a pity that the audio industry does no longer support and develop this fascinating audio recording format, that is so different from other formats of today (who said superior?). The obvious fact that analog tape recording won't undergo a renaissance one day makes it a quite exclusive recording format, used on unique equipment. Richard L. Hess (Audio Tape Restoration). It's highly magnetic Wiki stuff ! 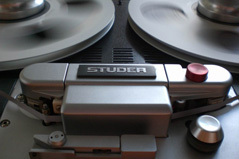 Those lucky ones who own Studer equipment can download below an outline of features of the Studer A810 tape recorder, summed up on a couple of pages in english and german language. Perhaps you'll find some useful information in it, before you pore on the hefty Studer manual with not less than 460 pages!